For many years now, the federal as well as state governments have been giving tax credits for the installation of high-efficiency, Energy Star heating and cooling systems. While many of the programs have expired, some still exist. However, the programs that have expired are the ones covering the most popular types of HVAC systems including split furnace and AC systems, split heat pumps and packaged systems of all types. A tax credit is more advantageous than a tax deduction. A deduction affects the amount of income you pay taxes on. For example, if your taxable income is $50,000, a $500 deduction will lower your taxable income to $49,500. The effect on your tax bill will be quite small, less than $20 if it’s anything. A tax credit takes the $500 off the top of your tax bill. For example, if you owe $5,000 in taxes, the $500 is deducted from that, lowering your taxes by the full amount to $4,500. Current programs federal tax credit programs currently cover geothermal heat pumps (ground source heat pumps), small wind turbines used to generate electricity and solar energy systems. These tax credits are in effect until at least December 31, 2016. A decision about renewing or altering them will be made in 2016. Here are the minimum efficiency ratings that each type of equipment must meet in order to qualify for federal tax credits. Geothermal Heat Pumps: Water-to-Air Closed Loop—EER 17.1, COP 3.6; Water-to-Air Open Loop—EER 21.1, COP 4.1; Water-to-Water Closed Loop—EER 16.1, COP 3.1; Water-to-Water Open Loop – EER 20.1, COP 3.5; Direct Expansion – EER 16, COP 3.6. Residential Small Wind Turbines: Must have a nameplate capacity of no more than 100 kilowatts. Solar Water Systems: At least half of the energy created must come from the sun. The system must be certified by the SRCC, the Solar Rating and Certification Corporation, or a comparable entity endorsed by your state government. The tax credit does not apply if the heated water is to be used for a swimming pool or hot tub. The hot water must be for use within the dwelling. 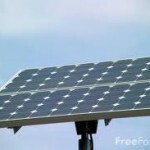 Photovoltaic System: The electricity created must be residential use. Keep all documentation related to your new HVAC equipment. You probably will NOT have to send it in with your return, but the IRS might request it at a later date. You’ll need to verify your purchase and that it meets the requirements. Make sure the form you download and submit has the correct year on it, such as 2012 for 2012 taxes and so forth. The tax credit is 30% of the total cost of the project, with no upper limit. Installation costs are included in the total project cost. The credit applies to both existing homes and new construction homes. Principle homes and second homes qualify, but rental properties do not qualify. The 30% tax credit takes a big chunk out of final HVAC prices.